So it turns out that after we put out our first issue, others felt the same way. So the second issue is bigger (50% bigger!) and better. Which is good, because it would have been bad if it was smaller and worse. We were joined by future frequent contributors James Romberger (Seven Miles A Second, Post York), Red Tape magazine publisher and poet Michael Carter, journalist Ann Marlowe (How To Stop Time: Heroin from A to Z) as well as underground film star and director Cassandra Stark. Writing by Cassandra Stark, Darius James, Doug McMullen, Ann Marlowe, B. Kold, Patricia Winter, Michael Carter, Joshua Whalen, John Farris, Steve Cannon and Sienna Farris. Art by Ari Marcopoulos, Martin Nederpelt, James Romberger and Sebastian Schroeder. 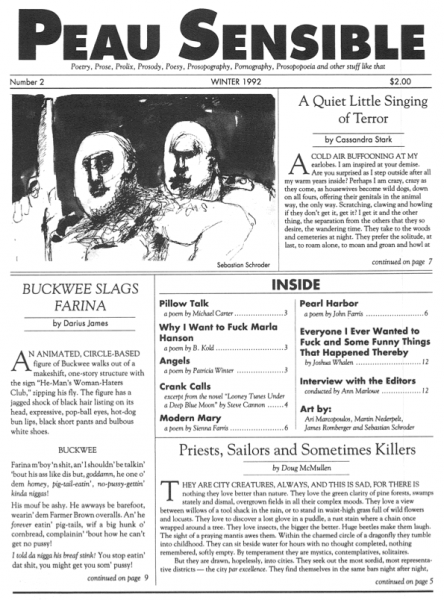 12 pages, Winter 1992, 8.5″ x 11″, black and white, PDF format.